The LHI pottery is known from the fill of the shaft graves of Lerna and the settlements of Voroulia and Nichoria (Messenia), Ayios Stephanos, (Laconia) and Korakou. Furumark divided the LH in phases A and B, but Furumark's LHIB has been reassigned to LHIIA by Dickinson. 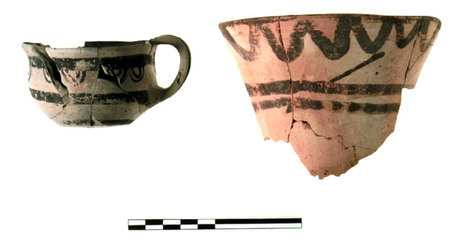 Some recent C-14 dates from the Tsoungiza site north of Mycenae indicate LHI there was dated to between 1675/1650 and 1600/1550 BC, which is earlier than the assigned pottery dates by about 100 years. The Thera eruption also occurred during LHI (and LCI and LMIA), variously dated within the 1650-1625 BC span. Not found at Thera, but extant in late LHI from Messenia, and therefore likely commencing after the eruption, is a material culture known as "Peloponnesian LHI". This is characterised by "tall funnel-like Keftiu cups of Type III"; "small closed shapes such as squat jugs decorated with hatched loops ('rackets') or simplified spirals"; "dark-on-light lustrous-painted motifs", which "include small neat types of simple linked spiral such as varieties of hook-spiral or wave-spiral (with or without small dots in the field), forms of the hatched loop and double-axe, and accessorial rows of small dots and single or double wavy lines"; and also the "ripple pattern" on "Keftiu" cups. These local innovations continued into the LHIIA styles throughout the mainland. The fine wares decorated with lustrous paint which constitute the basis for the differentiation between distinct LH I and LH IIA styles are heavily dependent on Minoan prototypes for both shapes and painted patterns. There is, at the same time, a considerable Middle Helladic "hangover" which takes the form of a persistence of Matt-painted wares and Middle Helladic shapes. 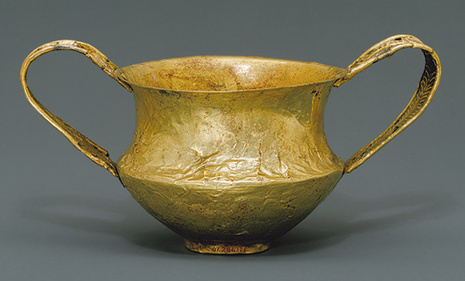 For at least the first half-century of the period under discussion, the component of Mycenaean ceramics inspired by Minoan models constitutes only a small fraction of the total amount of pottery in early Mycenaean contexts. There is currently a good deal of debate as to where the first recognizably Mycenaean (as opposed to Middle Helladic) style of the Late Helladic I period arose. Some see this development taking place in the northeast Peloponnese (probably in the Argolid, in the vicinity of Mycenae), but equally compelling evidence suggests that this style appeared first in the southern Peloponnese, probably in Laconia, as the result of Minoan potters, possibly from Kythera, taking up residence at coastal sites on the Greek Mainland such as Ayios Stephanos.